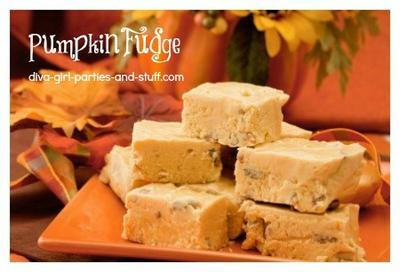 This pumpkin fudge recipe is just irresistible. Within minutes of it coming out of the fridge, it is devoured. Cook together sugar, pumpkin, cornstarch, spice and Carnation milk in a broiler. Stir constantly until mxture forms a soft ball when dropped in cold water. Add vanilla and let cool. Pour into a lightly greased 8x8 pan and refrigerate for two hours. Give the recipe a try and then let us know what you thought about it in the comment box below.